I may have stopped being a fan of wrestling a long time ago, but I have always been able to find some enjoyment out of the videogames. Since AKI’s great work on the Nintendo 64, from WCW vs NWO to the great (and still best) No Mercy. Wrestling games have been able to blend together decent single player content, fun multiplayer gameplay, and great creation suites, to give players a solid package that can last them the entire year. The past several entries in this long running series however have started to lose their appeal, requiring THQ and Yukes to try something drastic, luckily they did. In order to help rejuvenate this stagnant franchise THQ and Yukes have looked to the past to improve this series future. 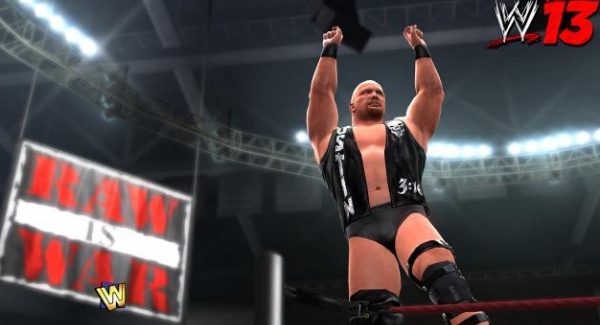 WWE 13 heavily features the “Attitude Era”, which is a time in which the WWF took a no holds barred approach to their broadcasts, in order to do battle with the more popular WCW brand. This period ran primarily from the mid nineties to the early 2000’s. The Attitude Era was the point in which I watched wrestling all of the time. This is the period in which all of the major players were at the height of their popularity, from The Rock, Stone Cold Steve Austin, Shawn Michaels, HHH, Bret Hart, Chris Jericho and so on, it was a good time to be a fan. After the Attitude Era was done and gone I checked out, and relegated any fandom for wrestling to its games. 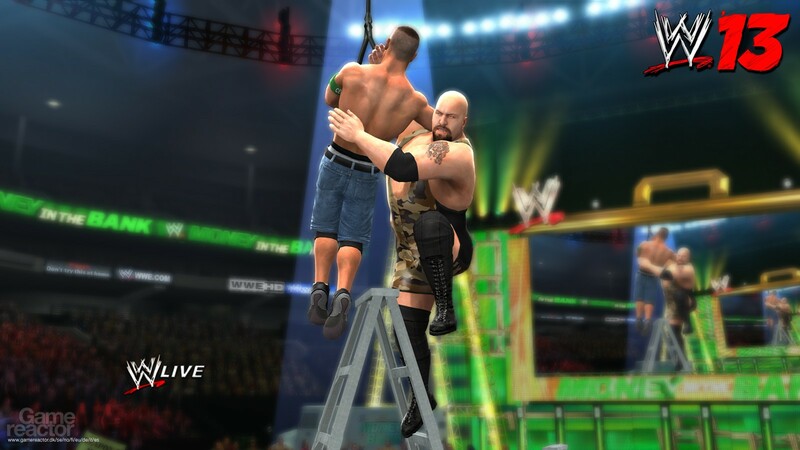 The WWE and Yukes both know that this time frame still holds much admiration from fans, and they have wisely chosen to feature it prominently within WWE 13. This makes this years title a solid purchase, both for old and new fans alike. Without a doubt this latest entry is improved greatly by Attitude’s inclusion, but thankfully there are still a number of tweaks, both big and small, that help round out this years game. To start off 13 includes the largest roster of any title to date, with over 70 wrestlers to choose between, each looking as realistic as possible and each having their signature entrances and finishers; it is quite remarkable to have included so many. The animation engine first introduced last year, called Predator, has been enhanced further for this years title as well, but not as much as I would have hoped unfortunately. Yuke’s made lots of noise last year about this new “Predator Technology”, claiming it would revolutionize the way matches looked and felt, but that just wasn’t the case. This year features more improved animations, but too much of the game still relies on animations from four years ago! While the new moves look great, they still stand in stark contrast to the older ones that still linger about. This technology improves the game visually, but still has not reached the lofty heights that Yuke’s has claimed it can. The audio has seen some improvement as well, but again, not to the degree that Yuke’s had promised. The fan noise and reactions to the action on screen have been adjusted, with actual recorded audio from live events. It is a shame then, that the audio levels and clarity weren’t better managed. This new attempt at better capturing the feeling of a live show is hampered further with the same laughably bad commentary as years prior. Commentary has always been clumsy and just flat out wrong in these games, and while it is good for a laugh, I think its about time they redo everything about the audio in these titles and give it the attention it deserves. While the presentation side of things hasn’t taken the steps forward that it should, the gameplay feels more fluid and polished than ever before. While you will still occasionally be annoyed by poor aiming and random glitches, the overall feel of a match is vastly improved. A match moves at a nice pace and the new homing feature makes sure that high flying attacks will better aim at their intended target, instead of flying over them. The game also better utilizes contextual features, making sure the appropriate moves are used at the right times. This years offering also includes new OMG! Moments; an inclusion that offers players the opportunity to recreate classic events from wrestling’s past. These contextual events allow players to break through barricades, break tables, catch finishers in mid air, as well as breaking the ring entirely. These refinements to the actual in the ring action help make WWE 13 the best recreation of the sport to date, and help make sure the most important aspect of the game, its gameplay, is getting the attention it deserves. As for modes, WWE 13 still features an incredible amount of variety. Universe returns with added flexibility, as does online play and the same great Create modes fans have come to expect. But this year also see’s an entirely new Career mode with the Attitude Era feature, and new match types such as Special Referee and I Quit, as well as King of the Ring. The Creation features have also been improved with a Title Edit option and more choices for the Create a Story. The biggest addition, as I said earlier, is still the inclusion of Attitude Era. While 35 classic superstars have been included for exhibition play, Attitude is most prevalent in its new story mode, which takes you from the very beginnings of the Era, to the very end. This Career Mode is fantastic, and without a doubt the highlight of the game. WWE and Yuke’s have done a terrific job making a long, fleshed out single player campaign that highlights and recreates some of the best moments of this prestigious time period. Attitude Era features six distinct chapters that highlight specific superstars, from the inception of D-Generation X, to the feud between Stone Cold and Vince McMahon, to the rise of The Rock; it is all featured here. Not only do you participate in these memorable matches, you will also see in game cinematics that recreate events from the live broadcast, as well as hear the original audio, from fan reactions to the commentary spoken. All of this would be enough of a treat for fans, but Yuke’s has also seen fit to include original video from WWE. This footage is original source materiel and is perfectly edited to showcase the story lines that you are playing out. To top off this exceptional attention to detail, Attitude Era features optional in match objectives; from simple goals of hitting your opponent with a chair, to elaborate 4 stage pieces. These missions help you play out the match as it originally happened and help reward you with over 100 unlockables. Attitude Era can last you between 10-14 hours in length, and is the standout piece of this package. With refinements to every field, and added features all around, WWE 13 is the best this series has been in a long time. Fans of the series can find limitless replay value in the online features, creation modes, and vast single player content, while newcomers can find simple enjoyment of beating the AI in exhibition contests. This series can still grow in many areas, but for a yearly title, Yuke’s has shown an attention to detail that puts every other sports title to shame, and with lots of DLC on offer, players can increase the already staggering 70 plus roster by an additional 20 superstars, and increase customization even further.